GOT ? 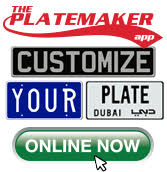 PLATE BLACK WITH SILVER LETTERS - Personalized just for you or for a great gift! GOT ? PLATE MIRROR SILVER WITH BLACK LETTERS - Personalized just for you or for a great gift!